Free Lighting Demo - We will install a temporary demo kit on your existing landscape to show what it will look like at night. We will quote a per fixture cost for installation so that you can budget the project accordingly. Please contact us here to request a lighting demo at your home for FREE! Lighting systems can be controlled by a switch, timer, photo-cell, or any combination. 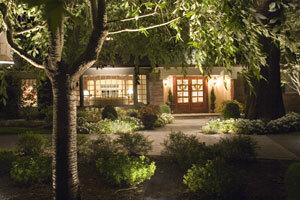 The goals of landscape lighting are both practical and aesthetic. A good lighting design addresses each of these goals. Security Lighting. It is well known that a well-lit property is less liable to be invaded or burglarized. Less known is that the placement, coverage, and quality of the illumination greatly determine the level of security. Safety Lighting. While safety is related to security, it is not the same. 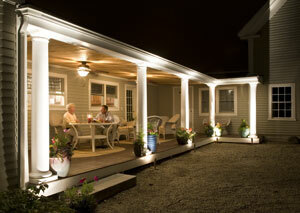 Safety refers to providing illumination that offers safe passage through the property. It especially targets steps, pools, water features, and tripping hazards. As with the strategy for security lighting, the illumination of hazards should be at a very low level - just enough to discern details, but not so bright as to obscure surrounding dark areas. Also important is that bulb filaments are not visible; fixtures that do not shield these filaments are known as 'light bombs'. When a visitor is subjected to one of these light bombs, he or she is momentarily blinded and may trip and fall. Nearly all flood lights, carriage lights, and entryway lights fall into this light bomb category. A good lighting designer will also consider the age of occupants and the presence of disabilities. Our threshold for visual perception increases with age; the elderly require far more light to safely navigate a property than do younger people. They may also be less able to see contrast in brightness, putting them at risk for missing steps or tripping on field stones. Task Lighting. Also know as usability, this goal identifies the need to provide appropriate illumination for the various regions of nighttime activity. 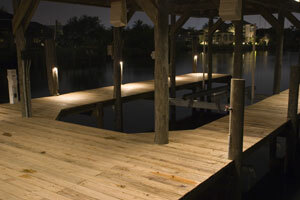 Areas such as decks, docks, patios, and sports courts require specific lighting designed according to the nature of the activity. Low voltage lighting with its small lighting fixtures and sharply defined beams are ideal to mange the illumination for such areas. Aesthetic Lighting. This encompasses a wide range of human factors and is the most subjective of the goals. The term, 'Beauty', is often used but this word reflects only some parts of the complex visual aesthetic. Aesthetics represents a holistic experience triggered by visual signals that are processed by the brain and judged to be appealing both superficially and with such depth that even the subconscious plays a role. In every case, a lighting project is judged to be aesthetically beautiful by both obvious beauty and by the wide range of emotions and feelings that arise from the visual experience. Cohesion. Lighting design needs to make visual sense to the viewer. This means that the property must be illuminated in such a way that the viewer recognizes key landscape and architectural features and that these features are revealed in a sensible relationship to each other. It is not that we intend to illuminate everything (as though it were daylight); rather, we employ selective lighting in ways indicative of nighttime - making use of shadows and light to reveal the inherent beauty and to create beauty where none existed. More specifically, cohesion refers to successfully illuminating regions so when the viewer glances across the illuminated scene, the various areas are connected in ways that make visual sense - no black holes that disrupt the viewers experience. Depth. Depth refers to the selective illumination of items and areas both near and far from the viewer. This brings a three-dimensional quality to the visual experience. In addition, it adds a participatory dynamism to the viewers world. When only the house is illuminated, the visual experience is flat, two-dimensional. Compare that poverty of experience to a property with illumination along the driveway, along pathways, around the periphery; such a design invites the viewer to participate in the illuminated world, to navigate among the illuminated objects, to see shifts in perspective, changes in shadows, and so on. 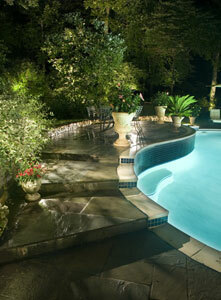 Integrating depth into the landscape lighting design creates a rich and rewarding experience. Focal Points. Every property and structure has distinctive features that serve as points of visual interest. The selection and illumination of these is key to a successful lighting design. The purpose is two-fold; first, to reveal their existence so they may be recognized and appreciated at night; second, to utilize them as visual anchors. This second function allows the designer to direct the viewer's experience, to entice them to first look at this object, then another and so on. Such direction seeks to control the viewers experience in much the same way as a movie director will direct camera movement to engage the viewer in the story's plot. 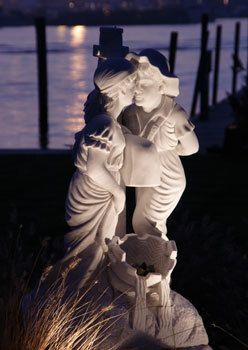 Common focal points include statuary, garden beds, specimen trees, and entry points. Light quality. This refers to the perceived visual nature of the illumination with regard to its affect on the human experience. Typically, the perceptions are described according to the emotional or visceral response. Hence, we hear of 'romantic lighting', 'dramatic lighting', and 'subtle lighting'; terms such as these can be said to describe the light quality. These emotional responses are achieved using a variety of techniques including direction (uplighting, downlighting, etc. ), beam control (diffusion, bouncing, reflecting, etc. ), fixture placement, and brightness. Perspective. This refers to the skillful placement of illumination that considers the viewer's location. Every property has walkways, driveways, and various private areas frequented by the homeowners and their visitors. 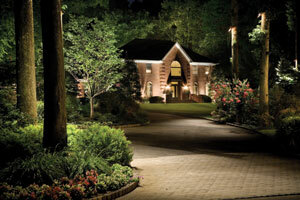 The landscape lighting designer needs to consider each location and create lighting schemes that present visual interest and serve the lighting needs. This is sometimes a challenging endeavor since an illuminated area may look better from one perspective than another. Another, even greater challenge, is the need to consider the viewers perspective from inside the home, and in areas that transition from inside to outside. Balance. This principle also relates to creating illumination that makes visual sense to the viewer. Human vision is primarily oriented towards daylight where illumination is fairly even across the visual landscape. Nighttime illumination is very selective with greater contrast between light and dark areas. While daylighting is fairly neutral in emotional response, night lighting can elicit a wide range of responses that span from scary to magnificent. Many factors contribute to these responses; one of them is the presence or absence of illumination that doesn't make intuitive sense. Consider a property where the right side of the lawn is very dark and the left side is illuminated; the viewer senses the imbalance, wonders why? A row of trees border a property, some are brightly lit, others dimly lit; why? A good lighting design recognizes the human desire to see balance from left to right and from up to down. Symmetry. Symmetry represents equivalence on either side of a dividing line. Similar to balance, symmetry is an arrangement that makes visual sense. It is found in architecture and in various regions of the landscape. When symmetry exists in the property, the lighting designer often illuminates it in such a way to preserve its visual impact. For example, when a house has a row of columns, these columns should be illuminated in ways that preserve their symmetrical appearance. The illumination on each column should be of similar appearance and brightness; failing to do so would be of detriment to the overall design. Visual Comfort. Illumination should not be painful or uncomfortable to the viewer. Lighting that is glaring, overly bright, or presents extreme contrasts in brightness not only detracts from the safety and security of site, it also detracts from the aesthetic enjoyment. Skilled designers try to hide the light source and only use fixtures that adequately shield the lamp. In addition, they control light levels with the viewers visual comfort in mind.